Analysis: The president's approval rating has been a flatline, which means he may need a rival as unpopular as Hillary Clinton in 2016 to pull off a second term. For President Donald Trump, it may prove to be the bounce that never comes. On the afternoon of March 24, the news broke that special counsel Robert Mueller had found no collusion between Trump's campaign and the Russians — a moment for which the president and his allies had been waiting almost two years. But a week later, Trump's average approval rating, according to the Real Clear Politics tracker, had climbed a grand total of one-tenth of one percentage point — to 43.2 percent from 43.1 percent. You could argue, of course, that Americans are reserving judgment. The complete Mueller report has yet to be made public, and the summary from Attorney General William Barr did note that Trump had not been exonerated on the issue of obstruction of justice. Plus, The New York Times reported Wednesday night that some Mueller team members may be dissatisfied with Barr's characterization of the report, and NBC News published a story on Thursday reporting that some members of Mueller's team believe "the evidence that Trump sought to impede the investigation is stronger than Barr suggested." Maybe when voters learn more, the numbers will move, in one direction or the other. Or maybe this is just the latest and loudest example of what we've seen over and over again during this presidency: a gigantic news development, followed by suggestions that a critical turning point in his public standing may be at hand, followed by …. well, pretty much nothing. In this case, there was talk that Trump's approval rating might increase, but usually it's worked the other way. 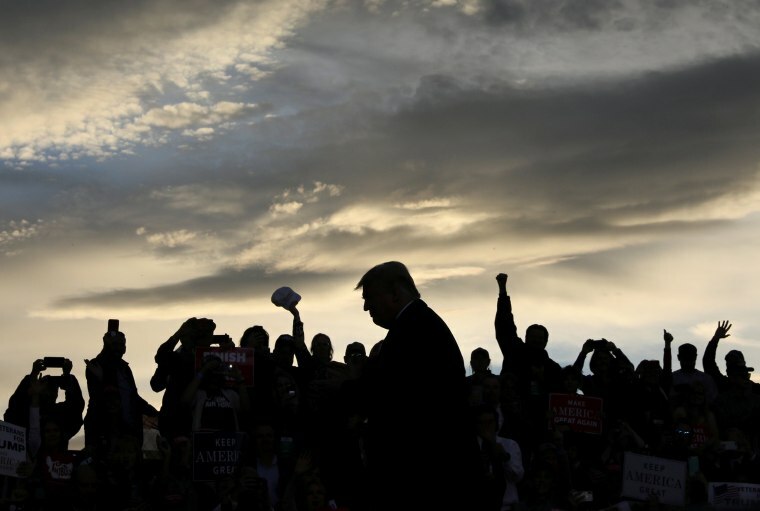 Trump will find himself in the midst of a swirling, all-consuming controversy, often of his own making, but even when his numbers do take a hit, the impact is minimal and fleeting. Take the summer of 2017. At the end of that July, the GOP’s poisonously unpopular Obamacare repeal effort came to the Senate, where it was sunk at the last second by Sen. John McCain's thumbs-down gesture. For Trump, it was an embarrassing rebuke from a member of his own party, one he seethes about to this day, and it was followed two weeks later by his widely condemned response to the "Unite the Right" rally in Charlottesville, Virginia. The volume and breadth of criticism Trump endured in those several weeks was, even by the standards of this highly unusual presidency, off the charts. And, in fact, there was some movement in his poll numbers. From 40 percent just before that fateful Senate vote, his RCP approval average dropped to 37.4 percent in the wake of Charlottesville. Headlines declared his support "crumbling" and "collapsing" and speculation kicked up about whether he'd soon plummet to the depths that Presidents Richard Nixon and George W. Bush reached toward the end of their presidencies. Instead, though, Trump's slide stopped, and the news rapidly moved on to new topics and controversies. A week into September, his average approval rating was back to 40 percent. The same basic cycle repeated at the end of 2017, when the news was dominated by allegations of sexual misconduct against Alabama GOP Senate candidate Roy Moore, and by Trump's refusal to turn on Moore. Trump's average approval dropped three points that December, but then Moore lost, the news moved on, and Trump climbed back up by three points. It was evident last fall, too — a decline of a few points after his former personal attorney and longtime fixer Michael Cohen's guilty plea and Trump campaign chairman Paul Manafort's conviction on tax and bank fraud charges followed just as quickly by a return to his baseline. And we saw it again recently, when Trump lost a few points during the government shutdown and then recovered them almost as soon as it was over. The reality, it seems, is that most Americans are set in their opinion of Trump and aren't about to change their minds, no matter what happens. Compared to his predecessors, Trump's approval rating has existed — for his entire presidency — within a very narrow range. His "honeymoon" brought him to a peak of 46 percent in the RCP average two weeks after his inauguration; two weeks later, it fell under 45 percent, a level he's failed to reach since. At the same, he's never fallen lower than 37.1 percent in the RCP average, a number he hit during those December 2017 travails. Every one of Trump's modern predecessors saw his approval rating cross 60 percent at some point in his first term. There was a certain level of popular goodwill that, under the right circumstances, those presidents were capable of garnering — and willing to work for. But Trump, it seems, can't get close even to 50. And actually, this is a pattern that predates his presidency. As a candidate in 2016, Trump's average support in RCP's general election poll tracker never exceeded 43.4 percent and never fell below 35.3 percent. Just as we've seen during his presidency, major developments — like the "Access Hollywood" tape — would dent his support by a few points, only for the controversy to be overtaken by other events and his numbers to tick upward again. This is not to say Trump is a popular president. He isn't. Nor has he been one. Nor is there much reason to suspect he will suddenly become one between now and the next election. The lack of a Mueller bounce is only the latest indication of how unlikely it is that anything will change the way the vast majority of Americans view him. But he was an unpopular candidate in 2016, and still managed to win, however narrowly. His victory came even though large majorities of voters didn't like him personally, didn't believe he had the temperament to be president and didn't think he was qualified for the job. Trump wouldn't be president unless at least some people who held all of these negative views of him voted for him anyway. To win re-election, he’ll probably need this to happen again. Which means he'll need an opponent who, by Election Day, is as unpopular as Hillary Clinton was in November 2016, when 54 percent of voters said they had an unfavorable view of her. It may be the single most important variable in determining Trump's re-election fate. Is there a Democrat who can engage in months of direct combat with Trump and emerge with anything like the kind of popularity Barack Obama had in 2012 when a majority viewed him favorably? Or does the tribalized political and media culture of the Trump-era ensure that anyone who steps into the arena with him will end up in the same shape as Clinton?